Lima Central Catholic’s Shaun Thomas made an immediate impact for the Thunderbirds after rushing for more than 1,200 yards. RETURNING STARTERS: Michael Jay Riepenhoff (SE/LB) Jr.; Ethan Truex (OL/DL) Jr..; Shaun Thomas (RB/LB) Soph. ; Ron Banks (RB/LB) Sr.; Rossi Moore (RB/DB) Soph. ; Micah Pearson (OL/DL) Sr.; Austin Campbell (OL/DL) Sr. PLAYER TO WATCH: Shaun Thomas. The sophomore running back had a breakout season as a freshman and could be ready for even bigger things this year. TOP NEWCOMERS: Jeremy Allen (SE/DB) Sr.; Caleb Heider (OL/DL) Jr.; Brant Smith (OL/DL) Jr.; Dylan Wilson (RB/LB) Soph. ; Zac Jacobs (OL/DL) Soph. ; Gavid Laird (OL/DL) Soph., Gus Cira (SE/DB) Soph. ; Quintel Peoples (RB/DB) Fr. ; Bryan Hines (RB/DB) Fr. Aug. 24 at Spencerville 7 p.m.
Aug. 31 D. St. John’s 7 p.m.
Sept. 8 Ada 7 p.m.
Sept. 15 T. Waite 1 p.m.
Sept. 21 at T. Rogers 7 p.m.
Sept. 28 at Woodlan (Ind.) 7 p.m.
Oct. 5 at East (Columbus) 7 p.m.
Oct. 19 Troy Christian 7 p.m.
Oct. 27 at Lucas 7 p.m.
They’ve seen what winning looks like and think they can do some more of it. Lima Central Catholic went from two wins in 2016 to 10 wins and two playoff games last season. Many of the more experienced players from last year’s team graduated but the Thunderbirds still are going into this season with a high level of confidence. “Coming off 2-8, I don’t think anyone expected us to be 10-2. We knew we had some guys coming. I think our kids are really confident. They just work hard. They’re excited. 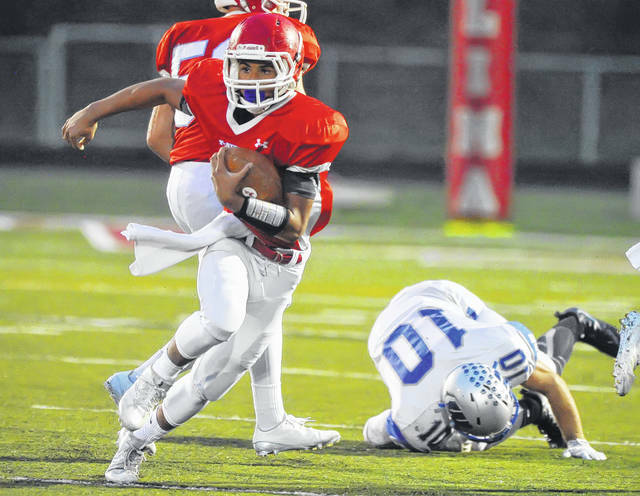 They expect to win,” LCC coach Scott Palte said. “It’s really amazing the difference in the mindset in two years. Coming off a 2-8 year, a lot of players just weren’t sure. Last year we beat Spencerville, which was huge, because we knew how good they were. We beat Ada and were 2-1 and the kids were like, ‘Hey, we might be all right,’ and the confidence was sky high. “Twenty-five of our 37 players are freshmen and sophomores. We’re young but we’ve got some talented guys,” he said. LCC has four returning starters on offense and five on defense, but has only five seniors on its roster and one of those is in his first year of football. Twelve seniors who were team leaders in addition to being talented athletes, including second-team All-Ohio linebacker Matthew Heider, are gone and the Thunderbirds will be playing more players two ways this season. But being deep and talented in the offensive backfield is one of the big reasons for confidence at LCC. Shaun Thomas, who rushed for 1,200 yards as a freshman, along with Ron Banks and Rossi Moore, give LCC three solid threats in the running game. Thomas, who was second-team All-Northwest Ohio, got 10 to 15 carries a game and averaged close to 10 yards a carry last season. This year, he could have a bigger workload. Banks, who was first-team All-Northwest Ohio and honorable mention All-Ohio as a defensive back last season, will play both ways. Moore also will play both ways after being a starting defensive back a year ago. Junior Nevan Stolly will be the starting quarterback. Thomas, Banks, offensive lineman Ethan Truex and wide receiver Michael Riepenhoff are returning starters on offense. Second-team All-Ohio lineman Micah Pearson, lineman Austin Campbell, Riepenhoff, Banks and Moore are returning starters on defense. “Caleb Heider and Dylan Wilson are going to have to step up at linebacker,” Palte said. “The offensive line— Zac Jacobs, Keegan Zupan, Pearson and Campbell and Brant Smith – those guys and some juniors who haven’t played a lot are going to have to step up for us,” Palte said. Right now Lima Central Catholic has a nine-game schedule because Bluffton (Ind.) canceled the final year of a four-year contract, which left LCC scrambling to find an opponent. Worthington Christian has an opening that matches up with the Thunderbirds’ week 8 gap and there have been some discussion between the two schools. This entry was tagged High school football preview 2018, limacentralcatholic. Bookmark the permalink.